The First Cabdriver in San Francisco? Mike Brannigan was—according to one of his closest associates—“a loafer, vagabond, drunkard, and thief.” I came across his story because he claimed to have been the driver of the very first carriage for hire in San Francisco. Mike, however, had a knack for storytelling, and no great reputation for telling the truth. For a brave scoundrel we have a fearful admiration, or, as Channing expresses it, a “shuddering sympathy,” but for this despicable specimen we can hardly condescend to afford disgust. Michael Brannigan was born in Ireland about 1829, and emigrated to the US in 1846, at the height of the Great Famine, when he was around 17. He lived in New Orleans for a few years, probably working as a tailor’s apprentice, before catching “gold fever” in 1849 and shipping out to California. He is said to have tried his luck as a prospector in ‘49 and ‘50 with no success, though he forged some advantageous friendships with other miners who did hit pay dirt. View of San Francisco harbor in 1849, from Rincon Hill. Public Domain image from Wikisource. 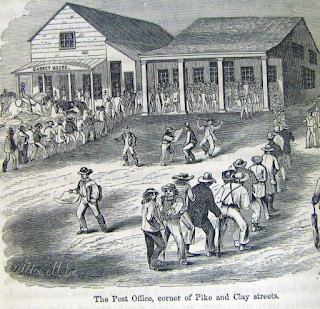 When the mail steamers would arrive I have seen a gambler give a man an ounce of dust—that is, $16—for his place in the long line of anxious people waiting their turn outside the old post-office, which was then at the corner of Brenham place and Clay street. Then you would have to pay $12 a dozen for articles to be laundried, and men used to throw soiled underclothing away and buy new articles rather than pay for washing. Waiting in line at the post office on steamer day. From the Annals of San Francisco. I owned and drove the first hack that ever rumbled over the streets of San Francisco. Well, “owned” and “first” turn out to be questionable here. And actually, Mike didn’t claim to own the first hack all to himself. As he told the story, in 1850 an Australian had shipped the carriage from Sydney, and Mike chipped in to buy it, along with two other Irish-born 49ers, Jim Travers and Johnny Crowe, for $1000. With two horses thrown in for $150 (though according to Brannigan they weren’t worth $10), the trio were in business. In 1851 I got $50 a night to drive Catherine Hayes, the famous singer, and her mother, between the Razette House and Tom Maguire’s Theater, which was then situated on Washington street, between Montgomery and Kearny. I also got the same sum from several others at the same time for the same trip. Mind you, that was a distance of about seven blocks, from the Rassette [=correct spelling] House at Bush and Sansome to Washington and Kearny. By most estimates, $50 in 1851 dollars would be worth over $1500 today. Today’s taxi fare for the same trip is a bit below $7. 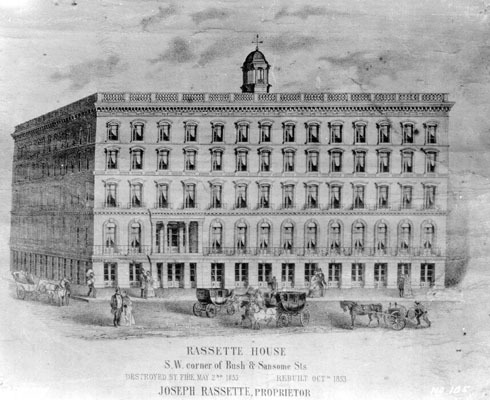 The Rassette House. (Image: San Francisco History Center, San Francisco Public Library). And that was nothing in a day’s work. Why, I’ve often—especially of a day when the steamer came in from Panama and with the mails aboard—why; then I’d get $25 a trip from the dock to the Razette House or the Tehama, as it chanced, and ten trips was nothing for an easy day. The rosy glow of memory may have fogged up Mike’s recollection of these early days. We have a more reliable record of San Francisco’s very early cab industry on a specific day in 1851, during the time when the city had been taken over by a gang of vigilantes (calling themselves the “Committee of Vigilance”). 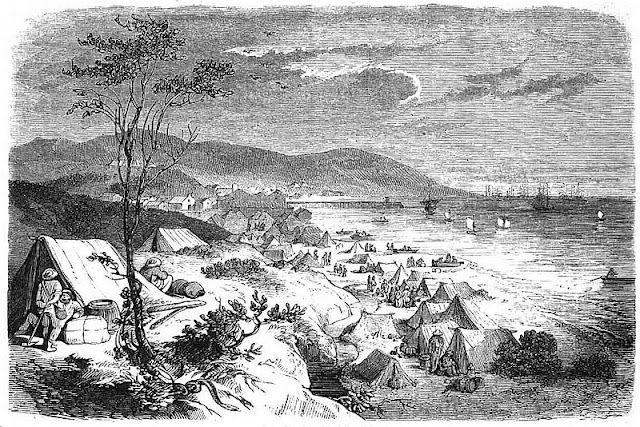 After hanging a number of Australians and exiling several other suspicious persons from the city, the somewhat paranoid Committee felt the need to track down just who had ridden down to the waterfront in a carriage and thrown a hat and boots into the bay on July 29th 1851; so, they gathered a report on the activities of all the city’s hired carriages on that day. This wasn’t too hard; there were a total of six, and only one of them had had any trips on that day, a single ride out to the cemetery. This does seem to contradict Mike’s story of easy money in the early hack business, though the city being under marshall law may have had a dampening effect on people’s desire to ride around in carriages. But here’s another fact: one of the six carriages in the report is listed as belonging to “Traverse & Crow;” but Brannigan’s name appears nowhere. The prosecution proved that defendant told Travers that he had opened the window of his (Travers’) house, on the 21st August, at 3 o’clock in the morning, and carried away the pup; Travers at this time charged defendant with having on his (Travers’) shirt. It was testified by John Crow, Travers’ partner, that defendant was a loafer, vagabond, drunkard and thief. [Crowe] also testified that he, witness, was at Sacramento on the night the burglary was committed—Mr. Travers having previously sworn that Crow, on that same night, cautioned him to look out for the defendant, that he would burn the building, which induced Travers to be particularly careful to make all fast before going to bed. The defense called only one witness, who clarified things immensely. Brannigan, this witness pointed out, “had worked for Travers & Crow, for several weeks,” and “that they kept him in clean shirts, to make a genteel appearance as agent for their popular carriages.” In other words, he was a hired driver working for the two carriage owners; the shirt in question was part of his uniform, to make him look presentable to passengers. Furthermore, while working for Travers and Crowe, Brannigan had brought to the stable three pups, one of which (a black pup) was to be the property of Travers. The pup which Brannigan had taken was tan. While this corroborates Brannigan’s later claim that he was in business with Travers and Crowe in the early days of San Francisco’s hack industry, it places him as merely a hired driver, not a co-owner, and as working only “several weeks” prior to September of 1852, by which time the partnership of Travers and Crowe had been in business for over a year. Nevertheless, Crowe and Travers certainly had it in for Brannigan—enough to mount a court case against him on what were evidently trumped-up charges. Maybe there was more to the story. The Justice, in reviewing the testimony, came to the conclusion that the shirt alleged to have been stolen was borrowed, and ought to be returned; that the pup claimed, belonged to the defendant, and that as there was no proof of the burglary beyond the admission of the prisoner, and he being proved to be a loafer, vagabond, drunkard and thief, it was but fair to infer that he was also a liar and unworthy of belief—under which consideration the Justice ordered his discharge. This judgment set the tone for much of Brannigan’s future brushes with the law. He almost always evaded punishment. And throughout all of his many, many court appearances, Brannigan was to repeatedly protest his innocence. And every now and then, he may have been telling the truth.